For some reason I´ve been “collecting” these Delta-Ton flexi-dics over the past. I liked the first Delta release that I found , so I picked up another one the next time I came across it. Collecting flexi-discs is a little embarrassing, because the majority of them are promotional items. It´s like collecting stamps. Apart from small group of like-minded weirdos, nobody seems to care for these wobbly little things. Luckily at least the music on these Delta-Ton flexi-discs has never been re-released, which makes it excellent copyright-friendly material for this blog. 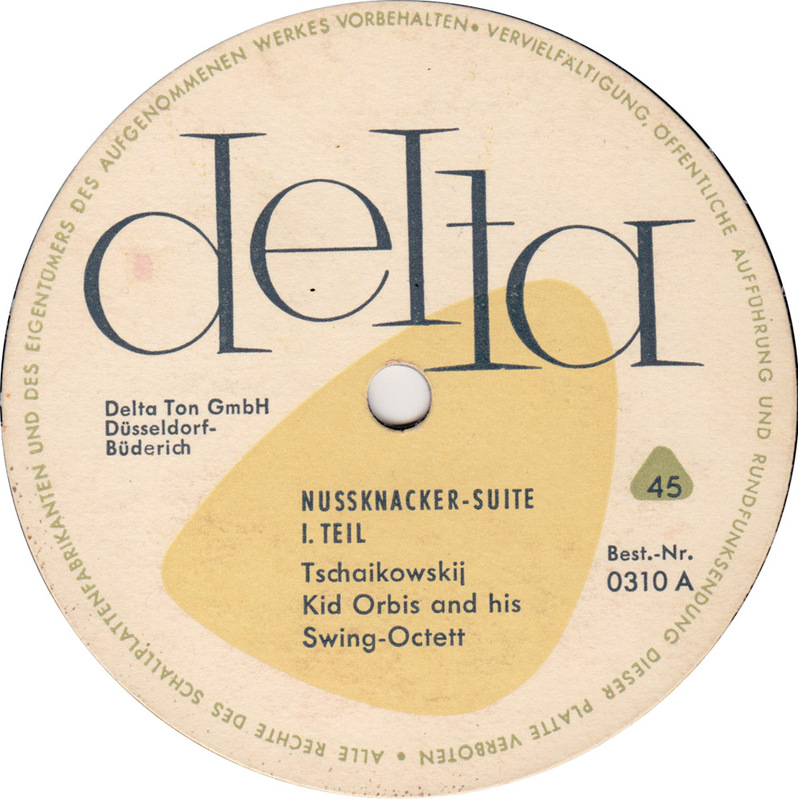 In the 1950s small independent record labels like the Delta-Ton Label out of Düsseldorf were trying to undercut the booming record business by selling their records cheaper than the average four Deutschmark. Flexible records would be sold at newsstands for something like one Deutschmark. Cheapo labels mostly released versions of hit songs recorded by no-name artists. But sometimes they did actually release original material, like in the case of Kid Orbis. The name Kid Orbis can be found on quite a few cheapo releases on various German labels like Delta-Ton, Opera, Tip Top and Universumin. Likely chosen to sound like legendary jazz trombonist Kid Ory, the man behind the pseudonym Kid Orbis was actually Wolfgang “Wolf” Gabbe. According to Wikipedia Wolf Gabbe, born April 28, 1924 in Berlin, first worked as an auto-mechanic before taking evening classes to become a drummer. After 1945 he started to play in swing and dance bands and made his first recording for the East-German Amiga label in 1948. Gabbe´s “Radio-Star-Band” remained a fixture in Berlin into the 60s. By the way, you might want to check out another Wolf Gabbe advertisement record that I posted some years ago here: “Hully-Gully-TÖFF-TÖFF” released in 1961 on the local Rondo-Exquisit label. Now maybe my taste is a little messed-up from listening to too many of these records, but I think Kid Orbis two takes on Tchaikovsky´s Nutcracker are kinda cool. I like the arrangement and there is some nice guitar work thrown in. Hi, Wolf Gabbe’s cv dates look very much like he’s the son of Rudolph Gabbe, who was the head master of the most remarkable school in Berlin of that NS time. Aufstehen. Kein Deutschland- und Horst Wessel-Lied. Keine Schularbeiten. Es war eine Lerngemeinschaft. Die Klassen waren fast ausschließlich von Erwachsenen belegt, die aus irgendeinem Grund versäumt hatten, ihr Abitur zu machen. (Der älteste Schüler war 52 Jahre alt.) Ein normales Schuljahr fand hier in sechs Monaten statt. Schulstunden gab es morgens, nachmittags und abends. Wer fleißig war und es so wollte, konnte innerhalb von zwei Jahren sein Abitur machen. Zwang gab es nicht. Disziplin auch nicht, denn wir ungezogenen Kinder waren so in der Minderzahl, daß es uns überhaupt nicht einfiel, aus der Reihe zu tanzen. Unsere erwachsenen Mitschüler hätten uns dann ganz schön angehaucht. Ich war schon früher gern zur Schule gegangen, aber diese neue Schule war das reinste Paradies. Wer den Kopf dafür hatte, konnte hier vier oder fünf Fremdsprachen lernen. Manche Schüler wohnten hier. Es war eine wunderbare, neue Welt. Niemand fragte mich, ob ich im BDM war. Niemand wollte wissen, ob mein Stammbaum rein arisch sei. Hier wurde gelernt, gelernt, gelernt. gut möglich, dass du recht hast und Wolf Gabbe der Sohn von Rudolph Gabbe war. Schön wär´s ja,wenn Kid Orbis Vater Leiter einer “Paradiesschule” gewesen wäre. Wer weiss…? Schönen Dank für´s fleissige mitrecherchiren. Habe übrigens zufällig gerade einen weiteren Kid Orbis Titel digitalisiert. Kommt demnächst.